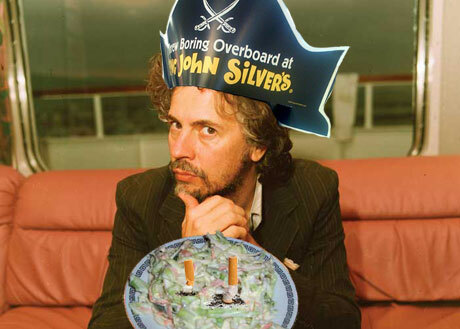 As any big-time Flaming Lips fan knows, the band's Wayne Coyne has done his fair share of time in the less-than-glamorous world of fast food. In his youth, the confetti-loving front-man spent nearly 12 years behind the counter at a Long John Silver's, a "quick-service" seafood restaurant in his Oklahoma hometown. It's a good thing for everyone that Coyne no longer has to work that day job, unless you actually enjoy eating cigarette butts. "I would do experiments with the coleslaw," Coyne recently told Spin [via Spinner] about his fast food past at Long John Silver's. "I made 50 pounds at a time, and I worked there for almost 12 years, so I made a lot of that. And I would get bored. So I'd dump ashtrays literally right into the coleslaw and run it through the cutter, just to see if people would notice." "They'd say, 'Oh, something was in my coleslaw!' And I'd be like, 'I don't know about that.'" However, despite all the food experimentation, it appears that even Coyne drew the line somewhere. "I never spit [in the food]," he said.